Donors funding in conflict affected environments would be wise to focus on women’s leadership in conflict rather than women as victims of violence in conflict. This is key to changing the power structures which underlie violence, and to supporting sustainable peace efforts. On 27 March 2014, a historic first was achieved: a peace agreement led by a woman chief mediator was signed. 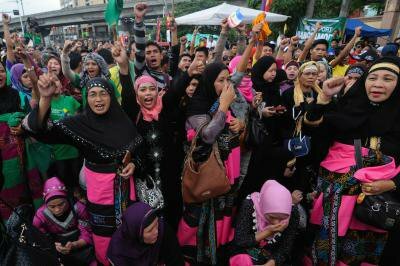 The Filipino government and the Moro Islamic Liberation Front signed the Comprehensive Agreement on the Bangsamoro (CAB), putting an end to four decades of civil war and almost two decades of peace negotiations. This is, clearly, an historical event for the Philippines and the region. But this agreement is not making history only for the peace that it will hopefully bring to the country - the CAB is also the first comprehensive peace agreement with a woman, Professor Miriam Coronel-Ferrer, affixing her signature as chief mediator. The international community committed to increase women’s participation in conflict prevention, post-conflict and peace-building in the landmark Security Council Resolution 1325 in the year 2000. However, despite the obligation to promote women’s participation in the different phases of peace processes found in this and several subsequent UN Security Council Resolutions, women’s inclusion in peace processes has continued to be limited both in numbers and in roles. UN WOMEN research on a sample of 31 key peace processes between 1992 and 2011 showed that out of the total signatories, only 4% were women and that women were only 2.4% of chief mediators, 3.7% of witnesses and 9% of negotiators. No women were involved as chief mediators in processes leading to the signing of Comprehensive Peace Agreements. Significantly, the UN has never appointed a woman chief mediator in peace process it has sponsored. But why is it so important to have women included in peace processes? First and foremost, excluding women means excluding half or more of the population from a key decision-making moment. Conflict and post-conflict situations disrupt social relationships and are a time when prevailing ideas and established ‘truths’ are thrown into flux. As such, these periods of struggle, also violent and horrible, can offer the chance of truly transformative change – by providing the foundations for re-distributing power between social classes, ethnic groups and genders, and addressing (and solving) the underlying causes of conflicts and inequalities. Secondly, evidence shows that if women and their views are included in decision-making, at negotiating tables and in governance and accountability structures, the result will be more sustainable peace and development. According to research more than 50 percent of peace agreements fail within five years of signature, in part because they do not include a variety of different voices in their negotiation. Finally, if women are not included in peace talks their demands for justice will be almost certainly ignored, with processes resulting in peace agreements that do not include vetting mechanisms for those responsible for violating human rights during conflicts, including those who perpetrated violence against women. For example, the Goma Peace Agreements, signed in 2009 between the Congolese government and armed groups in Eastern DRC, included provisions for the reintegration in the regular army of members of the rebel groups. These included Bosco Ntaganda, wanted by the International Criminal Court since 2006 for war crimes. It is not uncommon for war criminals to be integrated in post-conflict governments in the name of a fragile peace which serves the interests of a few powerful people. This is well captured in Abigail Disney’s film on the Liberian peace process, Pray the Devil Back to Hell, when one of the women peace activists equates the peace talks to a job hunt. Bringing women negotiators to the table means bringing different views and experiences which can then contribute to better, more inclusive, peace agreements. However, women’s presence at a peace table cannot be considered in itself a guarantee for a more successful and sustainable peace. Not all women are gender experts and not all women are interested in their community more than in their personal interests. What has been proved to really have an influence on the promotion of gender equality in a peace agreement is the existence of a strong women’s movement in the country, a movement of which female representatives at the peace table are the expression, and with which they maintain strong linkages. The gender equality commitments contained in the 1996 peace agreement in Guatemala, for instance, are largely attributed not only to the negotiation skills of Luz Méndez, the only female member of the Unidad Revolucionaria Nacional Guatemalteca delegation, but also to her links and continuous communication with the women’s movement of her country. However, as highlighted by the UN Secretary-General in his 2013 report on women, peace and security, ’much of women’s conflict prevention work continues to go unrecognized and lacks consistent funding and institutional support’. Funding women’s movements in countries with a volatile security context in a consistent, long-term and flexible way is key in supporting women’s role in conflict prevention. And, if prevention is unsuccessful and a crisis does arise, the existence of a strong and broad-based women’s movement allows women to mobilise quickly, and make it less likely they will be excluded from formal peace processes when the time for this comes. Donors funding in conflict-affected contexts would be wise to ensure their approaches focus on women’s leadership in conflict rather than women as victims of conflict. This is key to supporting sustainable peace efforts, which is why important initiatives such as the one promoted by the UK government to stop sexual violence in conflict need to maintain attention on the role that women as leaders can and do have in changing the power structures which underlie violence and oppression. Focusing exclusively on sexual violence in conflict without supporting the efforts of women organising against the root causes that foster such violence’s widespread use would miss the factor that makes the difference: women’s everyday participation and leadership in peacebuilding. Hopefully Professor Coronel-Ferrer will not be an isolated case for long.